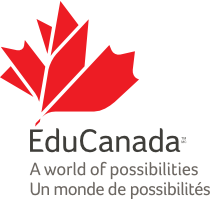 EduCanada is a brand that supports the international education offerings of Canada’s provinces and territories. The EduCanada brand is the result of collaboration between the provinces and territories through the Council of Ministers of Education, Canada (CMEC) and Global Affairs Canada. It is a protected trademark of the Government of Canada and is subject to a Master Licence Agreement between the parties. The EduCanada website provides information to international students about studying in Canada. You can search for study programs, get cost estimates and learn about study permit requirements. The EduCanada logo is displayed prominently at education promotion events organized by the Canadian Trade Commissioner Service around the world. It appears on branding materials from governments as well as educational institutions, such as Canadian universities, colleges, CEGEPs, language schools and kindergarten to Grade 12 schools. Education trade commissioners are located in most Canadian embassies and consulates abroad to assist Canadian public and private educational institutions, provinces and associations interested in recruiting international students. You can also access the Education section of The Canadian Trade Commissioner Service website for market intelligence and upcoming international education events. Global Affairs Canada is responsible for the Government of Canada's participation in major international scholarship opportunities for Canadians and non-Canadians. Through the International Scholarships Program, Global Affairs Canada provides support to international scholars in Canada; and to Canadians wishing to study or conduct research abroad. For international scholarships available for Canadians and non-Canadians to study in Canada or abroad, visit scholarships.gc.ca.